Here’s the first in what will hopefully be a series where I merge the kawaii look (essentially, cute or adorable) with common scenes/characters from around the hood in Los Angeles. Particularly the areas you might refer to as the barrio – East LA and South East LA, where I grew up. I was partly interested in creating an ironic juxtaposition, but, I can also admit, the look has grown on me. The common anthropomorphization, giving inanimate objects faces and expressions, takes me back to Pee Wee’s Playhouse, which both inspired and traumatized me as a child. Chairy, anyone? 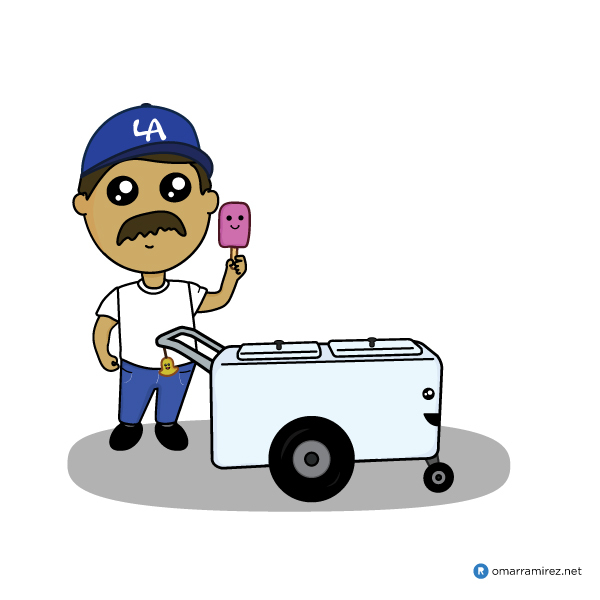 I start here with a paletero, or popsicle/icescream vendor. If you don’t know about them, ask any Mexican.